With due deference to everyone who has tweeted, retweeted, donated or sent best wishes to me and my quest for PhD funding, I thought that this blog post should talk about some of the medieval gardens I’ve been researching, and the variety of sources available for such a study. ‘Then he increased all manner of good in Gwynedd, and the inhabitants began to build churches in every direction therein, and to plant the old woods and to make orchards and gardens, and surround them with walls and ditches, and to construct walled buildings, and to support themselves from the fruit of the earth after the fashion of the Romans’. Some evidence for this reorganisation and improvement of Gwynedd has been identified, most recently by David Longley, and his research into the medieval landscape of the island of Anglesey. However, there are problems which mean that further work is still needed. Archaeological excavations of medieval high status sites in Wales have tended to be small in scale, and to date very few high-status Llys (Royal Court) sites have been excavated. Exacerbating this is the fact that only some of the Llys site locations are known, as they fell out of use during the fourteenth century because they were no longer needed by the new administration. The Edwardian castle at Rhuddlan (Latitude 53.288595; Longitude -3.463749) serves to highlight some of the issues which I have encountered during my research. This castle was constructed from 1277 onwards to replace an earlier motte and bailey castle on a nearby site to the south, which in turn replaced a Llys, the location of which is most probably under the motte and bailey earthworks. The motte and bailey castle is in the trees to the right of the image. Edward I, as part of the provision for his wife, Eleanor of Castile, and her household, had constructed for her a garden within the castle precinct between July 1282 and March 1284. The location for this has been suggested as within the inner courtyard of the castle, where it would have been overlooked by the Royal apartments. The documentation states that encircling the head of the castle well (which had a boarded roof), a little fishpond lined with four cartloads of clay brought from the nearby Rhuddlan marsh was created and set around with seats. The adjacent courtyard was laid with 6000 turves and the lawn fenced with the staves of discarded casks. Excavation of the moat in 1949. Unfortunately I have not been able to find any archaeological documentation to accompany the photographs taken, meaning any environmental evidence, including medieval plants, which may have existed within the moat has now been lost. In addition, there has been no programme of survey or excavation within the inner courtyard of castle, meaning that the location of the garden and fishpond is not conclusively identified. 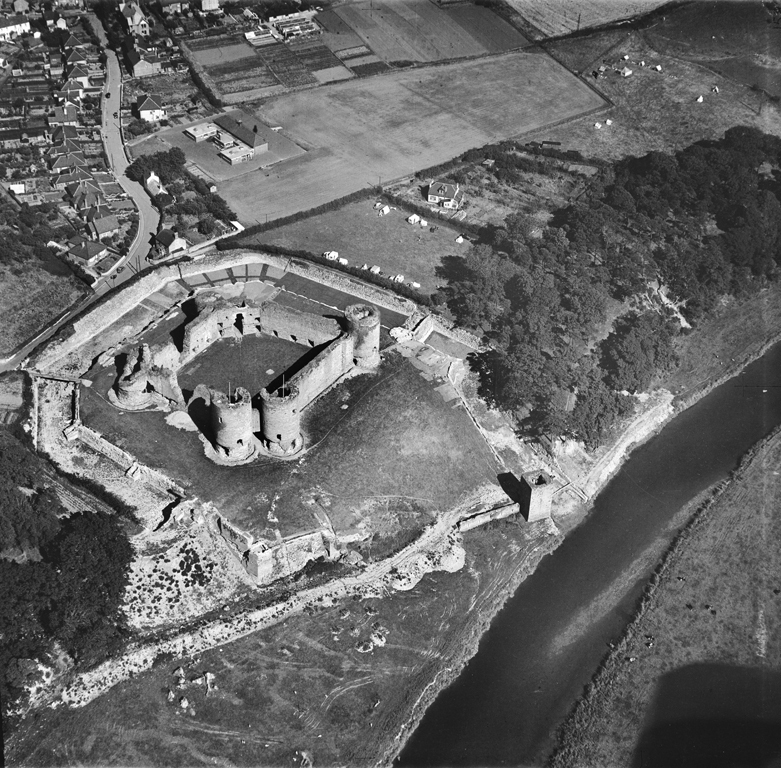 During my research, I re-examined the historical sources, and found mention of a second garden at Rhuddlan Castle in 1285. This was described as a herber (a pleasure garden) opposite the north gate of the castle, and significantly, outside of the castle precinct. Fieldwork I undertook earlier this year suggests that this herber lay within the ditch to the north of the castle and may well have been accessible from the River Clwyd immediately to the west. The location of the herber is at the bottom left of the first photograph under the trees. 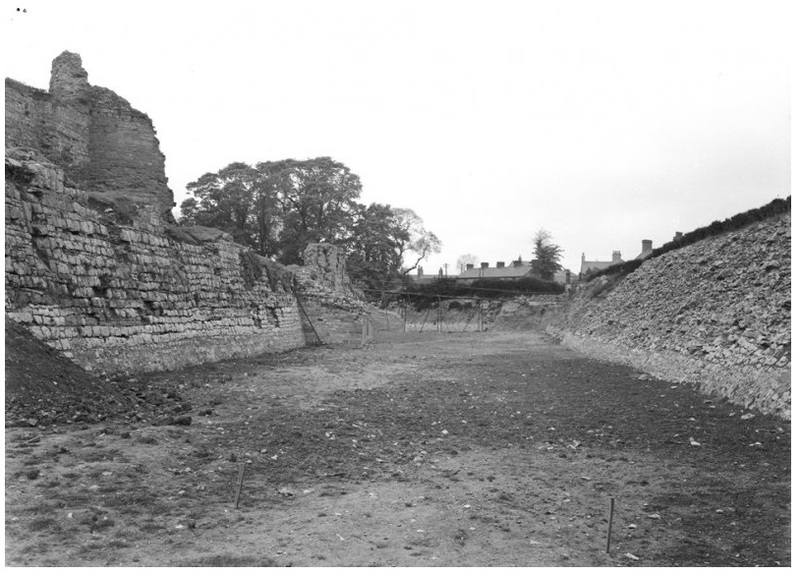 Further research of sites such as the Edwardian Castle of Rhuddlan will revolve around planning the best recording strategies for these two garden locations, whether that is deemed to be survey or excavation. Given that there is in close proximity an earlier motte and bailey and a Llys site, both of which are likely to have gardens of one form or another associated with them, there is exceptional potential for understanding the change and development of Royal gardening taste of both English and Welsh Royalty during the medieval period.